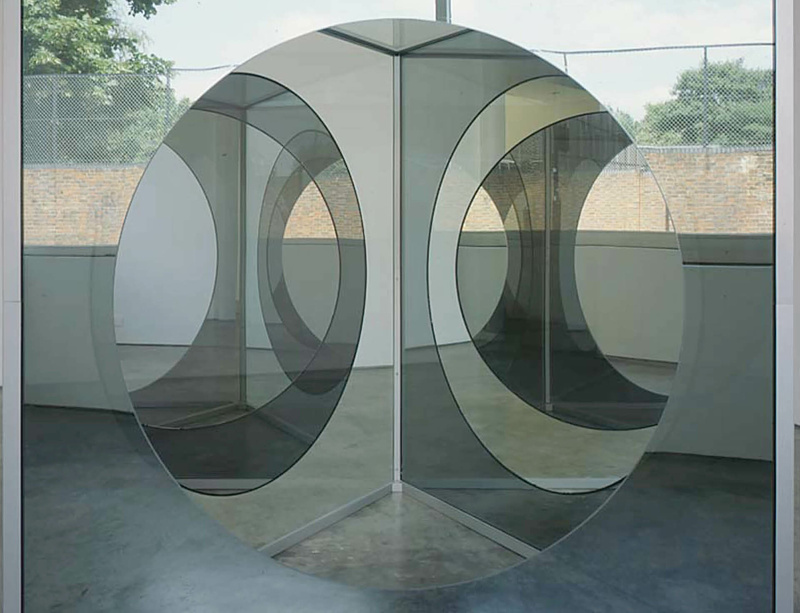 To coincide with its survey exhibition, 'Models and Beyond', the Museum De Pont in Tilburg has commissioned Dan Graham to make a new work to accompany another of the artist's pavilions, which was bought by the institution in 2005. Over a period of roughly thirty years, Graham has experimented with straight, triangular, circular and meandering shapes for his pavilions; and aside from using glass with varying degrees of transparency and reflection, he has also worked with materials such as perforated steel, wood and shrubs to devise pavilions that are sometimes literally illusory. At times they have a theme, as does the Children's Pavilion from 1989, which Graham designed in collaboration with Jeff Wall for the Rotterdam district Ommoord, though it was never carried out. They might also have a function, as a skateboard pavilion for instance, or they could be part of an existing building, as was the case with the Rooftop Urban Park project, installed on the roof of the DIA Art Foundation in New York. This exhibition comprises some fifteen architectural models, both realized and unrealized, which do justice to this great diversity. While Cinema, the maquette dating from 1981, is a tribute to early modernism and even resembles Jan Duikers's 1934 Cineac in Amsterdam, with his Model for Yin Yang from 1997 Graham ridicules, on the other hand, artists' and architects' new-age flirt with Eastern spirituality. The small maquette for Two Adjacent Pavilions is one of the earliest, dating from 1978. Later architectural models are often much more ambitious in terms of scale and execution, and they function as independent works of art. Frequently these models are accompanied by a video of the realized pavilion, in which the situation and varying light conditions are such an important part of the experience.